Most of us were quite impressed with the female Monk costume created and modeled by Christina Estrada, while winning the costume contest at last year’s Blizzcon. Quite a few of our male readers were rather impressed by Christina herself, to judge by the comments you guys left. It turns out that Christina is a model, and sometime after Blizzcon she wore her outfit for a special shoot with professional photographer Chase Hoffman. In the pictures Christina is striking some martial arts poses, illuminated by swirls of colorful special effects. The pics are very nice, and you’ll probably enjoy the flickr gallery of Christina‘s modeling shots as well. Or her DeviantArt page, or her CosPlay.com page. . (Unless you thought that platinum blonde Monk hair was really hers.) The only thing wrong is Chase Hoffman’s promotional skills, since they posted the shots all the way back in late December, but they didn’t break out until today, with posts on Kotaku and a bunch of other gaming blogs. Since I was thrilled to hear that one of my clients had won the contest, I wanted to do a shoot with her and her winning costume. Pictures of Christina as the monk were already everywhere, so I needed to be creative. That?s when I got the idea to shoot her with light painting. 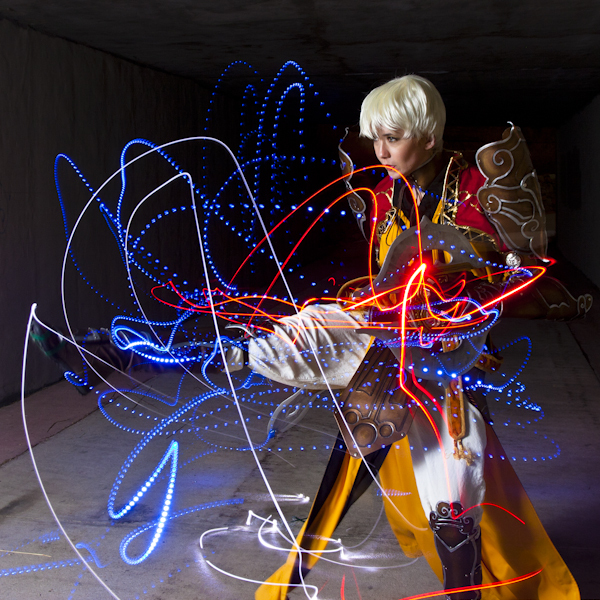 Since video game and anime character often use magic, super powers or special abilities, light painting is a natural fit. Backgrounds can be controlled well so the whole photo can take on an other-worldly feel. When I told her my idea, she didn?t need much convincing, so we went for it. The basic technique was a flash with an reflective umbrella that was camera left and radio triggered. We attached small LEDs to her weapons and her foot. After that, it was a trial and error (but not much error this evening). One of the great things about her costume, unlike some other ones, is that she could move around in it. The monk is supposed to be a master of martial arts. So having a costume that actually allows your to kick and punch is great. 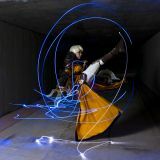 You can see all these pictures, plus more of Christina’s Monk costume and lots of others (just as soon as I move them over) in our newly-created Diablo cosplay gallery.